Voice of the Youth Network is about encouraging every Filipino youth to believe in themselves by creating and promoting positive social change and by making a difference in the country. We inform, inspire, involve and Empower the Filipino Youth WorldWide. Clean water. Fresh air. Foods. Health. Education. Justice. Equality. We all need these. With the UN Goals for Global Goals, otherwise known as SDGs (Sustainable Development Goals), everyone in the world could reach it with no one left behind as long as the coherence and cooperation within and across countries, subjects, and sectors exist. Universal, inclusive, and indivisible, the Global Goals call for action by all people from all over the countries, especially the youth leaders. As part of the world, youth also have responsibilities and rights to contribute to the realization of Global Goals as a key to transform our world.As a youth capacity development platform, Indonesia Global Network has consistently put effort to arrange some programs which relevant to today’s need of youth for the world’s better future. The organization is eager to create a platform for an alliance between youth leaders which will accommodate ideas from youth all over the countries. Through the programs, youth leaders will get more perspectives from the world thus they will enhance more understanding about related issues. 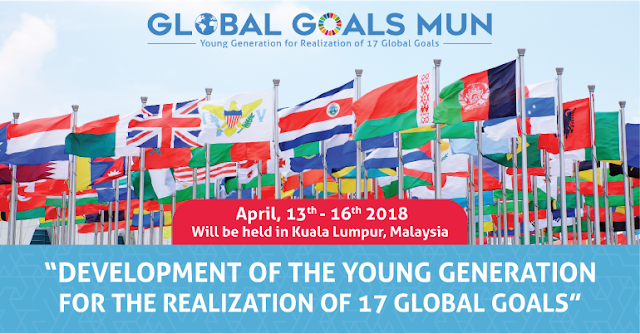 To provide a better understanding of SDGs, known as Global Goals, Indonesia Global Network presents Global Goals Model United Nations (Global Goals MUN). Global Goals MUN will provide MUN parliamentary based forums with topics related to the 17 Global Goals set by United Nations to encourage delegates to understand each point of SDGs, to share ideas among delegates, to network, and to improve their communication as well as diplomatic skill. To train the critical thinking of the students about the global issues. To train the skill on solving the international problem and enhance the skill of diplomacy. Youth from North America, Europe, Asia, South America, Africa, and Oceania are welcomed. Delegate participants must be enrolled in a high school, university, fresh graduate high school with maximum age 25 years. High school and university level conferences will operate separately with the exception of sessions in the United Nations. Advisors who have a role in planning and organizing a MUN conferences and teachers who use Model UN in their education curriculum are also welcomed. Eligible Regions: North America, Europe, Asia, South America, Africa, and Oceania. IYF WORLD YOUTH CAMP 2019 IN GENERAL SANTOS CITY! Do you think SK should be abolished or reformed? Voice of the Youth is a youth network aiming to inform through its advocacy which is to encourage youth to take control of life situations while building self-esteem and improving the quality of life for themselves and for the community. VOTY members are dedicated to serve and present their talents to young Filipinos to promote youth participation and development through leadership, advocacy and education.